Use this link to find the contact information for your U.S. Congressional delegates in Washington DC. Members of both the United States Senate and the United States House of Represenatives are linked here. Use this link to find the contact information for your Louisiana delegates in Baton Rouge, LA. Members of both the Louisiana Senate and the Louisiana House of Representatives are linked here. Learn about the federal legislation titled the Coastal Wetlands Planning, Protection and Restoration Act. This federal legislative history describes an abbreviated summary of the Act. Use this link to print a booklet of mulitple general CWPPRA project fact sheets. 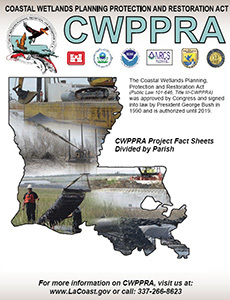 Booklets may be organized by Congressional District, Parish, Priority Project List, CWPPRA Agency or CWPPRA basin. Use this link to print the 2012 Evaluation Report to the U.S. Congress on the Effectiveness of Coastal Wetlands Planning, Protection and Restoration Act Projects.